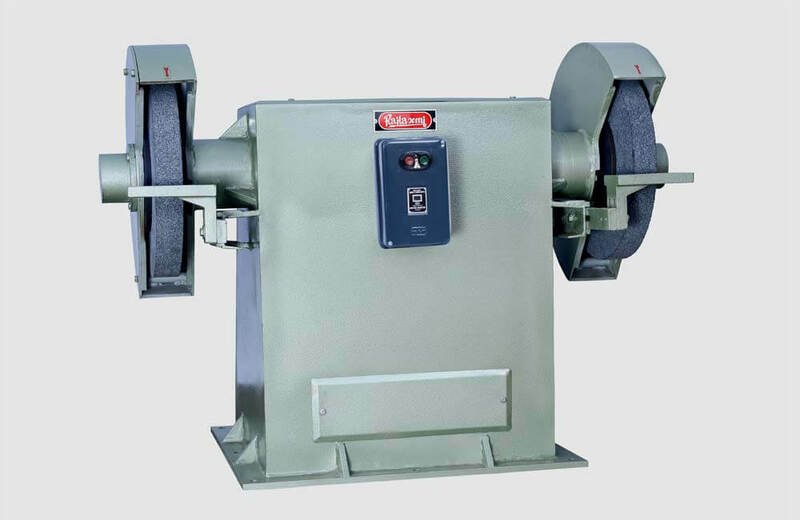 “Rajlaxmi” Brand Double Ended Heavy Duty Pedestal Wheel Grinding V-Belt Driven Machines Are Specially Designed to Provide Heavy Metal Removal in Engineering Workshops, Foundries, Forging Units, Casting & Hand Tools Manufacturing Units, Garden Tools Manufacturing Units, Valves & So Many Industries. Each Machine Is Complete with Electric Motor, Starter, Two M.S. Wheel Guards, Two Spare V-Belts in The Base, But Without Grinding Wheels. It Helps Grinding and Polishing Uneven Thickness Components Can Be Used On Every Material Just Need to Change Belts According. Each and Every Fast Revolving Part Is Dynamically Balanced Such as Pulleys, Shaft Rotor and Wheels, Hence Leading to Longer Life of the Machine with No Vibration Resulting in Less Fatigue to Person. Each and Every Part of Rajlaxmi make V-Bet Stone Grinding machine Is Made On C.N.C Machines Leading More Accuracy to Every Part with Extra Running life.